Thanks for walking with me through the tedious process of getting a new prosthetic arm. I’ve enjoyed sharing the experience with you. Do you remember as a kid standing ankle-deep in a cold pool of water? You wanted to swim more than anything. You knew you were going to jump in soon. But you hesitated because the water was freezing. Finally you said, “One, two, three, go!” and jumped. That’s how I feel when I get a new prosthesis. I’m glad I have it. I know it has improvements over the former arm. But I hesitate wearing it because I know what is coming. My life won’t feel normal for a while. Instead of subconsciously moving, I will be aware of every move. I may have to change the actions of my shoulders, back, and upper arms some. The harness will touch my skin in new places, causing irritation and sometimes pain. It won’t be pleasant. So I have to say, “One, two, three, go!” and jump. 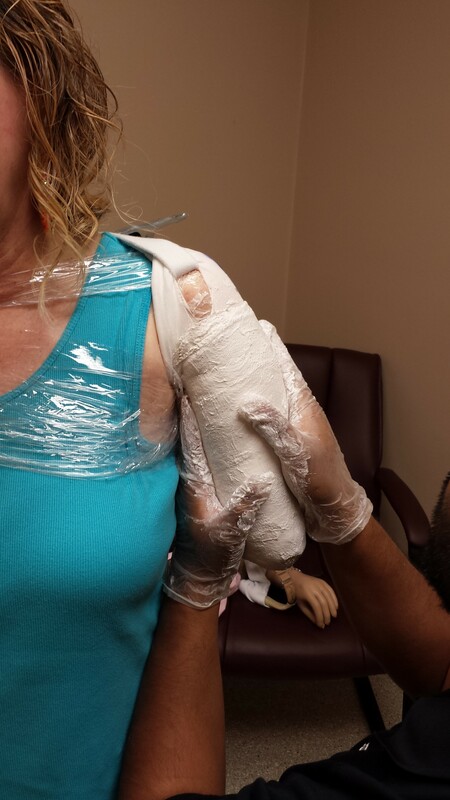 4/13/17- When I arrived at Fourroux Prosthetics, the final lamination of the upper arm was completed. The harness was permanently attached to the prosthesis. The harness straps were adjusted. Areas of the harness that rubbed my skin were covered with moleskin or padding. The hand grip was tightened. The arm was OFFICIALLY FINISHED and I was able to take it home with me! After wearing the arm for a few days, I realized two straps were too tight and needed to be replaced. 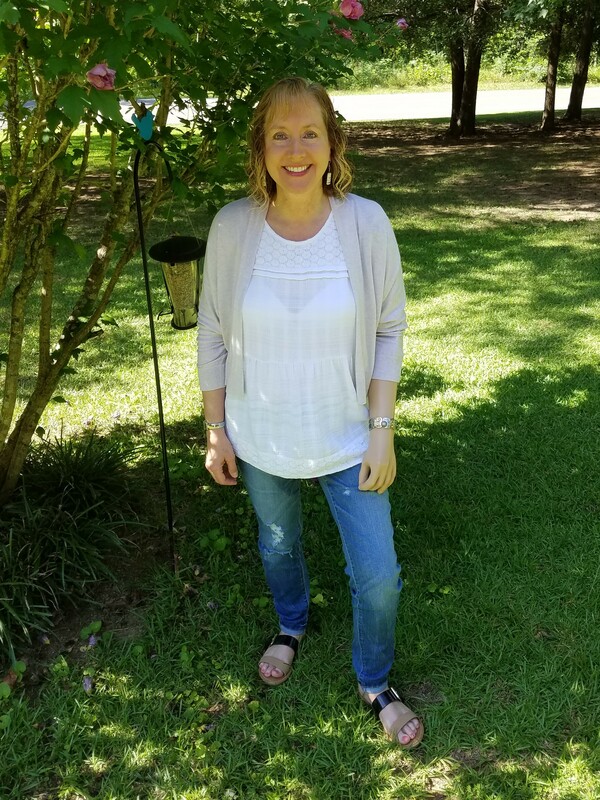 I returned to Fourroux on 5/18/17 for the minor changes. I was on the road leading tours in May and June. Looks like July is my month to JUMP! “You created earth and sky by your great power—by merely stretching out your arm! There is nothing you can’t do” (Jeremiah 32:17 MSG). Read “New Arm- Part 1 (Picking Out Body Parts)” HERE. 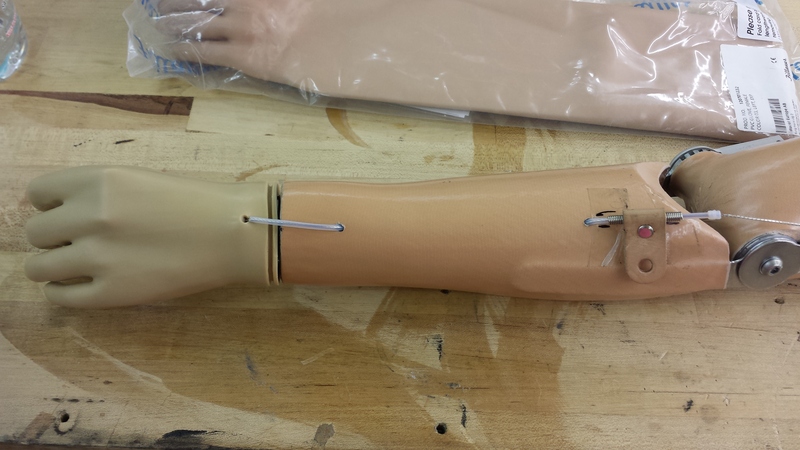 Read “New Arm- Part 2 (Designing the Arm)” HERE. Read “New Arm- Part 3 (Building the Arm)” HERE. Read “New Arm- Part 4 (Pausing to Get It Right)” HERE. For those who might be interested, I invite you to walk with me through the tedious process of getting a new prosthetic arm. I’m journaling the steps and my experiences along the way. You can interact with me by sharing thoughts and comments, if you wish. I facilitated a three-hour leadership seminar recently in Auburn, Alabama. Community leaders were seated behind tables arranged in a “U.” For a full hour and thirty minutes I spoke in the center, moving about and interacting with the 35 participants. Just before I dismissed the group for a 15-minute break, I told a personal story about being born with one arm to help illustrate a point. During the break, a woman approached me. This happens to me quite often. Half of the credit goes to the great prosthetics people who help me so much. The other half of the credit goes to the slick operator with 54 years of experience. 6/20/16- The lower arm was made when I arrived. It was very thin and had no outer lamination. Adan (Prosthetist), Caitlin (Prosthetic Resident), and Brad (Fabrication Manager) worked diligently with me for seven hours. We concentrated on positioning and mounting the elbow. Two separate pieces were involved—the locking unit on the inner side next to my body and the joint unit on the outer side. These connected the upper arm to the lower arm. Once again, I had to make sure the angle of the lower arm when bent was where I wanted it (left to right). We decided how much to cut out on the top side of the lower arm at the elbow to allow for flexion (how far up I can bend the arm). The gap between the upper arm socket and the inner elbow unit will be filled in with foam and laminated over. This will make the shape and size of the upper arm match my real right upper arm. 7/1/16- The inner and outer elbow units were laminated in when I arrived and the gap between the upper arm socket and the inner elbow unit had been filled in and laminated over. For eight hours, Adan, Caitlin, and I worked on suspension and line-of-pull. These are difficult to explain, but I am going to try. Suspension is how the prosthesis is held onto the body. Straps attach the prosthesis to a harness. The harness goes across my back and under my right arm. Line-of-pull involves attaching additional straps to cables that operate the elbow and hand. The straps, harness, and cables have to be positioned in exactly the right places and at exactly the right angles for me to be able to operate the prosthesis smoothly. A slight change in a position or angle can make a huge difference in the ease or difficulty of operation. I’d put on the arm, I’d attempt to operate the arm, they’d evaluate, I’d take it off, they’d make a slight adjustment, I’d put on the arm, and repeat the cycle—all day. We made progress, but we didn’t yet find that sweet spot. When we do, I will be able to use shoulder and upper left arm movements to raise and lower the forearm, lock and unlock the elbow, and open and close the hand. 7/15/16- I hung out with my friends at Fourroux Prosthetics for eight more hours. We finalized suspension and line-of-pull. Adan sewed padding on the harness in spots that were uncomfortable. I decided exactly where I wanted the hand positioned most of the time. (I’ll still be able to manually rotate it at the wrist slightly to type.) They drilled a hole just above the wrist unit, fed the hand cable through it to hide it, and brought it back out near the elbow. 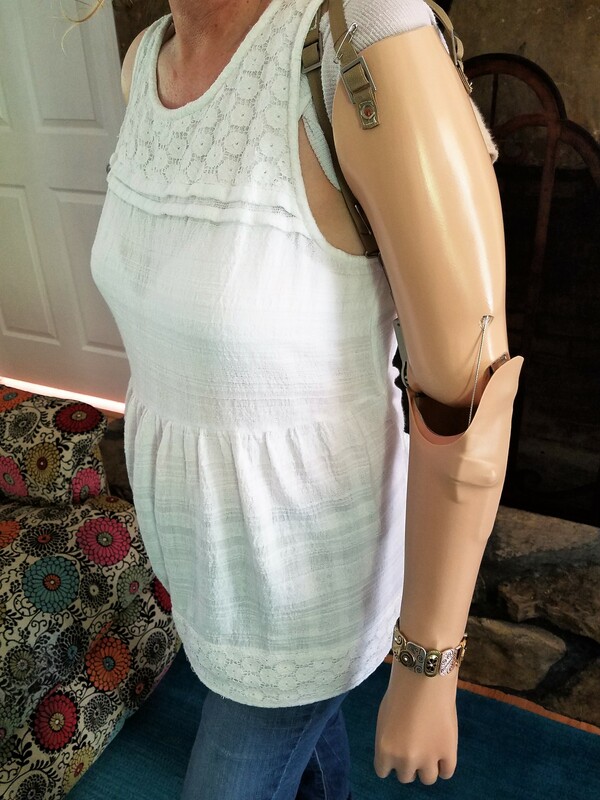 I “took delivery” of the arm (paid my portion) for insurance purposes so I could take it home and wear it for a few days. 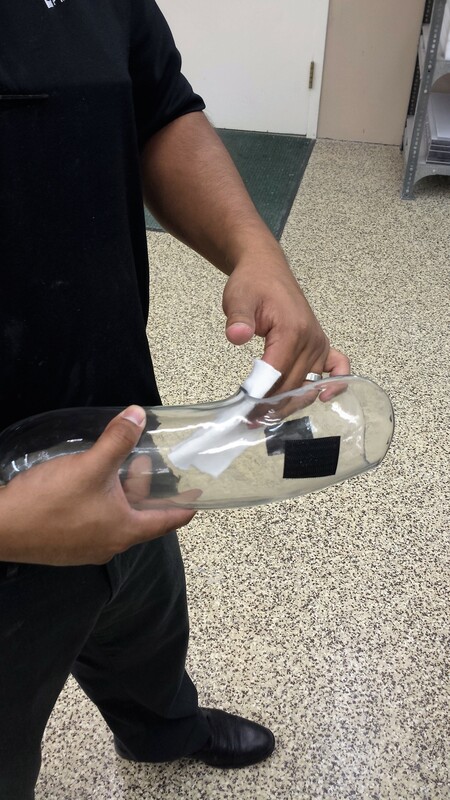 I will make sure it works like I want it to before they do the outer lamination. 8/31/16- I dropped off the arm to Adan. I was not able to test it as originally planned because the hand made a noise like fingernails on a chalkboard when I opened it. I couldn’t stand it! We are not sure what is going on. He will have the team get on it right away. No rush on my part though. I am going to be speaking several places and leading tours over the next two months. I won’t be able to return until November. Thanks for walking with me through this process. What are your thoughts about the building phase? I know my life motto is “Never Say I Can’t,” but I’m going to open up and be totally honest with you right now. There are two things I can’t do. First, I can’t clap. I wish I could clap. I can put my hands together and pretend to clap with others in an audience, but it doesn’t make a sound. Sometimes I clap my right hand on my leg or borrow a family member’s hand to clap against. And second, I can’t scratch my right arm. Rubbing up against a door jamb works pretty well, or directing my husband where to scratch. But thanks to prosthetics, I can do everything else. On 5/30/16, Fourroux Prosthetics called to tell me my body parts had arrived. Normally shipment doesn’t take a month, but a merger between two major prosthetics manufacturers (Hosmer and Fillauer) slowed the delivery. 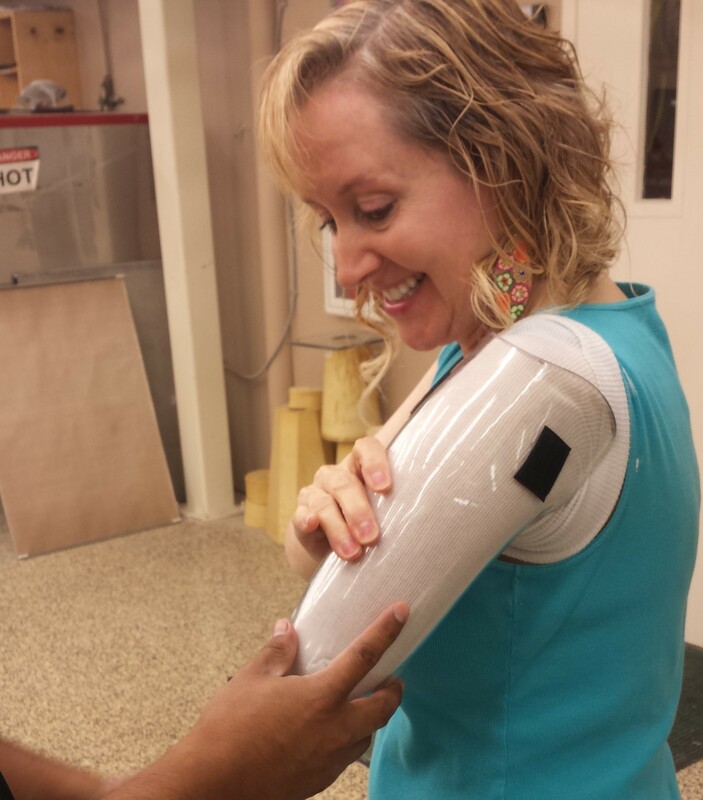 On 6/8/16, I met with Adan (Prosthetist) and Caitlin (Prosthetic Resident) to design my new arm. 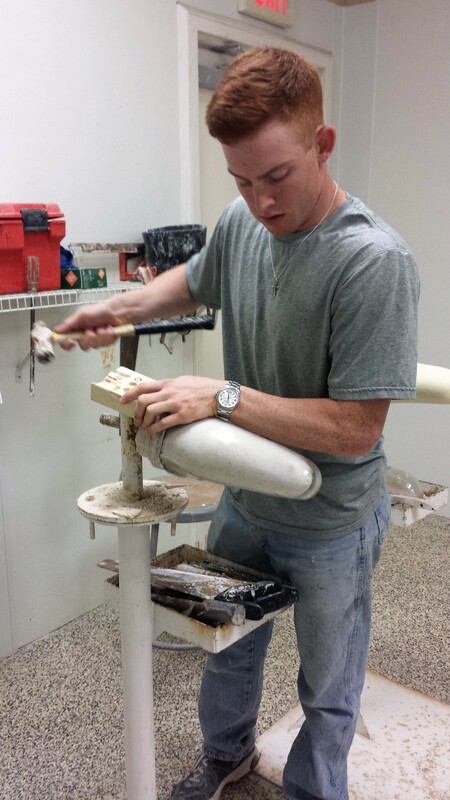 Eli (Intern) and Brad (Fabrication Manager) were also on hand to help. (These are the people I am referring to throughout this post when I say “they.”) It was a long seven-hour appointment, but it was the best day I’ve ever experienced in a prosthetics facility. They allowed me to hang out in the lab and watch the entire process! 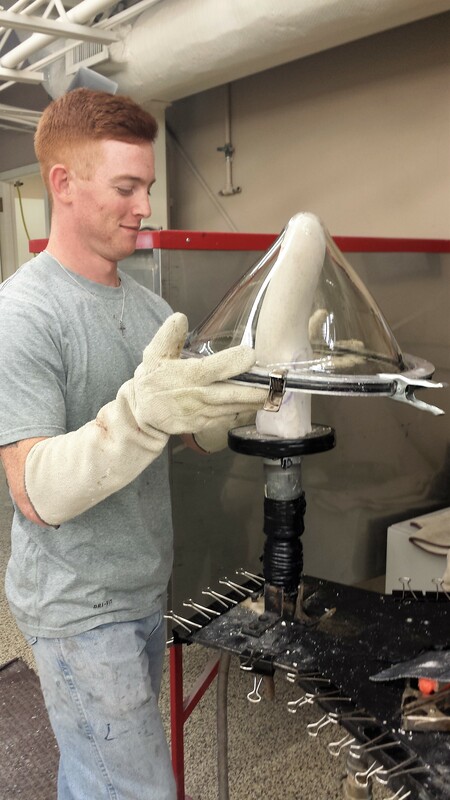 I’ve worn a prosthesis for 54 years and this is the first time I’ve gotten to see how one is made. Adan made a plaster cast of my upper left arm. They poured plaster in it to create a mold. 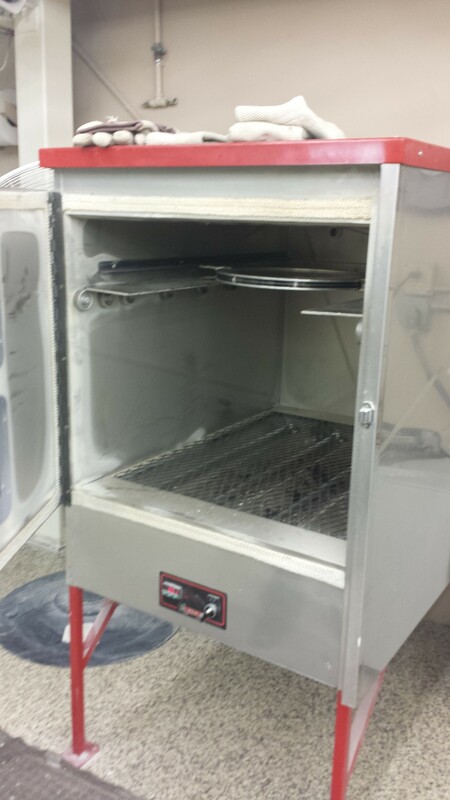 They heated a heavy plastic sheet in an oven and laid it over the mold to create the test socket. 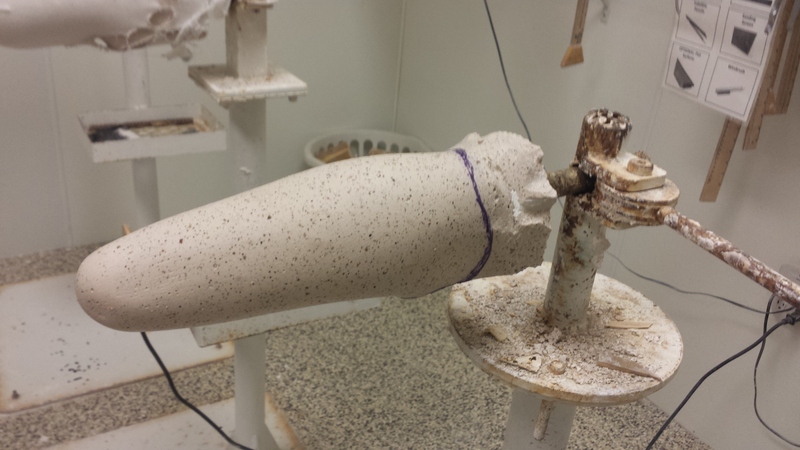 Once cooled, Eli removed the plaster mold from inside the test socket. A bit of inspiration... by email! The Inspire Channel Short videos to pull you up and push you forward– to INSPIRE you!